Mimicking the sound of a classic while trying to achieve something akin to an advancement can be a tall order. 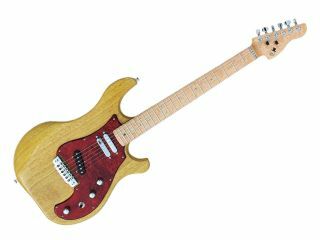 But Rees Guitars, with its new T3 model, have done just that. Here is a Tele sound with a twist. For years now, guitarists who have wanted a marriage of all three 1954-era single-coil sounds with the power of a humbucker have been out of luck. The T3 succeeds in this union by using three vintage replica single-coil pickups, and using them with innovative control circuits to create both vintage correct "Tele" voices and closely related fuller humbucker voices. 1) Vintage compatible. The neck and/or bridge pickups are used. The middle pickup is not used. The voices will be familiar '50s style, using accurately constructed vintage replica pickups. 2) Phased coils. The middle pickup is added out-of-phase to the neck and/or bridge pickups. Good for special effects. 3) Humbuckers. The middle pickup is added in serial humbucker manner to the neck and/or bridge pickups. This provides three bright "Tele"-like sounds, but with more power, longer sustain, fuller fatter tone, and more punch. It is considerably more convincing than simply replacing the neck single-coil pickup with a conventional humbucker. (Several different humbuckers were tried during development). From the looks and sounds of things, we're convinced that we have to see what all the fuss is about. The T3 lists for $1,650.00US. For more information, visit the official Ree Guitars website.